Warning: do not read this blog if you are hungry. 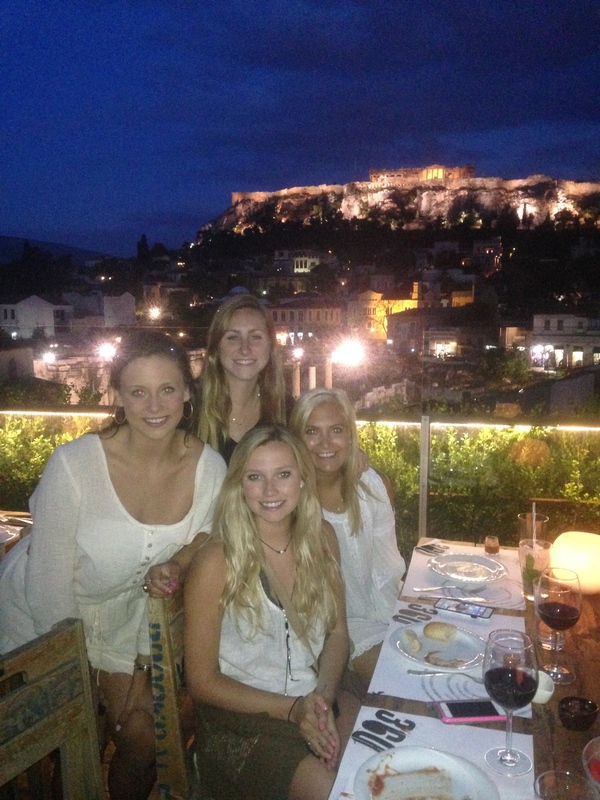 Katie Adler from Louisiana State University counts her favorite places to grab a bite in Greece! This restaurant is worth the 20-minute cab rid into Athens! It not only offers a wide array of delicious food, but also a breathtaking view of the Acropolis. This restaurant is located on the rooftop of a building in Syntagma Square, and the view is truly one of a kind. Although the food is incredible and reasonably priced, it is a “cocktail bar”, so be prepared to eat smaller portions of food. But prepare yourself for some incredible fruity cocktails. My friends and I happened to stubble across this little gem one night while wandering Nimdon Square (just a few minutes walk from the hotel). This restaurant served us the best sushi and lemon drop martinis we have ever had! Not to mention the hospitality of the wait staff was the best we have experienced on the trip. Take it from a sushi enthusiast; this place was worth every penny and fattening bite. Would it make you nervous to eat Mexican food in Greece? Well it shouldn’t if you eat at Amigos in Nimdon Square! This restaurant defiantly has the fasts service. The food came out extremely quick, which I have come to find, is rare in this country. The food was eerily similar to the Tex-Mex we are used to in the States. And free shots at the end of a meal are a bad thing, right?! It is not so much the food that makes this a top place, but the spectacular view. Imagine a crystal, clear lake hugging a massive, cave-filled cliff. Not to mention it is dead quiet and quite possibly the most peaceful place I have ever visited. The food reminded me of what you would find while sitting pool-side at a country club back home. Only a short taxi ride from out hotel, both visits were delicious and breathtaking. Saving the best for Last! This place was hands down the best place I ate during my stay in Athens. From appetizer to desert, everything was simply amazing. The nutella pizza dessert is a must-have, and this restaurant I simply a must-go! And no matter what diet you think you are on or how much weight you think you are gaining, you must splurge on dessert and get the famous nutella pizza.